My Matron goddess is Hekate, and I have only recently found her. Ever since I came to be under her wing, my fear of change and the darkness within me and without have vanished. As an old and ancient goddess, she is known for many things. She is most famous for being accepted into the Greek pantheon of deities, where she warned Demeter of the kidnapping of her daughter Persephone. She is considered a cthonic goddess, or a dark goddess. Dark not necessarily meaning 'evil' or 'bad', dark in the sense that she pushes us to our limits, to face the darkness in us and to face our fears of change and other things. To me, she is very motherly-grandmotherly; loving yet firm. She stands behind me with her hand on my shoulder pushing me forward in her torchlight. She is a goddess of the triple cross-roads, meaning that she knows all that is to be seen in the past, present and future. With her key, she unlocks the mysteries of your inner self and the treasures in your subconscious. With her torchlight, she guides you to face your darkness, your fears and dislikes about yourself . 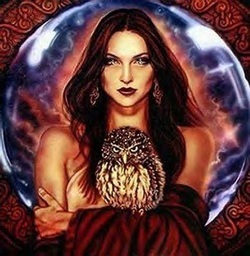 Here she is also depicted holding a knife or an athame, perhaps this is because she is considered a patron goddess of witches and the craft itself? She is also considered a goddess who looked after the poor and desolate, who like her, are rejected by society out of fear and disgust. She has dogs with her as they are an ancient symbol of fertility of the earth and though she is not depicted with it here, the snake and other nocturnal animals are also claimed by her. By seeing the moon, she is considered a moon goddess much like Artemis, for only at night, during the darkest hours does her torch shine the path that is set for you. Being triple formed both represents her ability to see three ways and to represent her maiden, mother and crone-like aspects, but to me, she is more of a mother and a crone. I have grown close to Hekate in my short time with her, though I know there has always been a desire to be with her.